Scene 1: mealtime pre-babies. Enter two well-rested, well-dressed adults who eat a hot, healthy meal. Heck, they might break out a fine beverage to accompany their delicious meal because treat yo'self. They chat about politics and the interesting books they are reading because, of course! Scene 2: mealtime post-babies. Enter one defiant four year old and one crabby 1 1/2 year old, one mamma wearing sweats splattered with dried oatmeal splatters from this mornings breakfast battle and one baba wielding 18 different food options. The parents gently coax the babies to their seats for mealtime. Chaos ensues. The end. If you're a parent, you can probably relate to some version of Scene 2. Mealtime with kids is challenging, fun, interesting, and did I mention challenging? So when Oxo asked if I'd be interested in trying their toddler friendly booster seat, divided plate, and fork & spoon set all designed to make mealtime easier, I was in. I am a huge fan of Oxo products (especially their Pop containers) and love that they are both practical and pretty! The last time we checked in, Little Lady was just about to start eating solids. Fast forward about a year and we have a charming toddler with some very strong opinions about food. Little Lady refuses to sit in her high chair anymore because "I big." In all honesty, I was a bit weary about the booster seat because well, "I big" but she willingly hopped on and actually refused to get off. The seat easily straps on to a regular chair, and the booster folds in half when not in use. The padded cushion is firm but comfy and most importantly, it pops right off so you can wash all that applesauce-mac-n-cheese-corn mixture away easily. Oh, and it comes in so many great colors including a rather chic grey! Next, I present this divided plate. It's perfect for offering toddlers a variety of items so they eat real food and heck, even try some new things! I've found that Little Lady will eat a decent amount if there are small amounts of a few things on her plate. Give her a plate of one thing and she's out. Give her too many options and you have chaos. Obviously, it's a fine balance my friends and this plate is here to help. And finally, the fork & spoon set. Look, I get it, a fork is a fork is a fork. But when your 1 1/2 year old wants to feed herself, a fork is not just a fork. You need a fork (and a spoon!) that is perfect for that chubby hand determined to get food in her mouth. 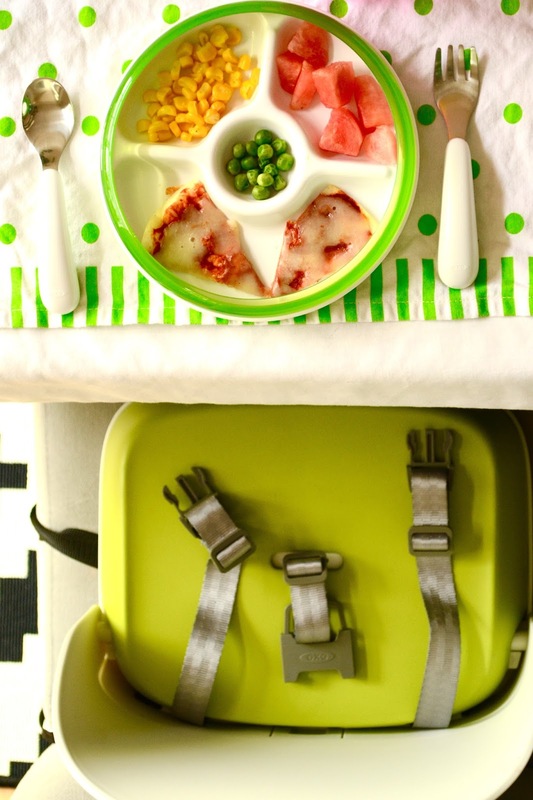 This fork and spoon set is specifically designed for little hands to grip easily. We're such huge fans, we even have a set in our diaper bag that Little Lady uses when we eat out! So now that you have your gear, let's get to the good stuff. What are the babies snacking on these days? Allow me to introduce you to the tortilla pizza. It's the snack (and often, dinner) of choice 'round these parts. It's quick and healthy (and totally adaptable). Both kids eat it willingly (hallelujah!) and um, many times, the mama and baba eat it too so it's a one snack/meal fits all kinda deal. 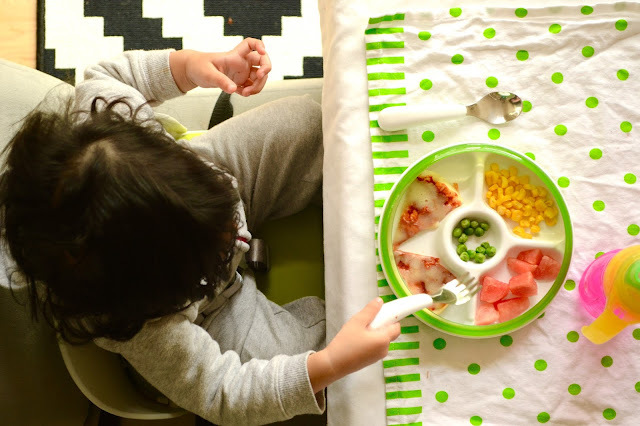 So next time, you find yourself faced with a picky toddler that would rather run around than sit and eat, or you're visiting a friend with a baby and want to bring a cute gift, consider these toddler-friendly mealtime doodads. They're tested by Little Lady and she gives them a sticky thumbs up! I received the three products listed above for purposes of this post. I only review products that I believe in and all opinions are always my own (and in this case, I tried to put Little Lady's opinions in words but years from now, she'll probably roll her eyes and huff, "Oh mom!"). Heat heavy skillet on the stove. Lightly oil one tortilla and cook on low heat for a few seconds. Flip the tortilla over, and spread 1/2 of the pizza sauce on the cooked side. Top with 1/2 of the mozzarella and parmesan cheese. Cook on low heat until cheese melts (you may need to cover the skillet to melt the cheese). Repeat with the other tortilla. For the mama and baba version, I'll top with all sorts of things including roasted red peppers, sun dried tomatoes, mushrooms and fresh basil. Once, we topped the tortilla pizzas with eggs and popped 'em under a broiler for a few seconds and they were awesome. But in all honesty, I normally just flip the tortilla for 2-3 seconds after the cheese has melted so that the cheese side is now face down and it crisps up the cheese just fine. Very nice this Tortilla Pizzas!